The 6th Naval Beach Battalion was commissioned 9 October 1943 under the command of Eugene C. Carusi, USNR, an Annapolis graduate and Washington D.C. attorney. The Battalion was formed in July and trained exclusively for OVERLORD, the Allied permanent re-entry into Continental Europe. Upon arrival at Camp Bradford, VA in July 1943, personnel were assigned to one of four sections: communications, hydrographic, boat repair or medical. As training progressed, these Navy specialists began to resemble an Army battalion, broken into three companies and nine platoons. Each platoon had a medical doctor and was headed by a Beachmaster and his assistant. WWII Naval Beach Battalions were indistinguishable from Army assault troops. While training at Fort Pierce, these Navy amphibians wore coveralls, field shoes, life belts, gas masks, leather gloves and full packs with rifles slung over their shoulders, engaging in joint maneuvers with the Army off the coast of Florida. Having been issued Thompson submachine guns and wearing steel helmets with a sky blue "6" (later a red arc) painted on the front, the 6th Naval Beach Battalion appeared more like soldiers than sailors. 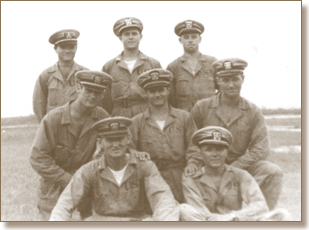 The nine Navy doctors of the Battalion were issued Colt 45s and then reassured by instructors that in the event their shots ever missed their mark during combat on the beach, they would at least have the pistol to throw at the enemy! The Army counterparts of the USN beach battalions were amphibious engineers. Dr. Ralph Hall, a recent graduate of Syracuse Medical School, wrote to his pregnant wife that he "joined the Navy to get out of the Army. The army boys that are here joined the Army and are headed to go to sea and fight from boats. All is very ironical." On 7 January 1944, after six months of intensive amphibious warfare training at Fort Pierce and Camp Bradford, the Battalion traveled overseas on the SS Mauritania to the UK in preparation for the invasion of Normandy. Training continued in Swansea Wales and the 6th Beach Battalion was attached to the 5th Engineer Special Brigade 12 April 1944 in order to achieve a closer coordination between the Navy afloat and the Army ashore during the invasion landings. In support of the 16th Regimental Combat Team, 1st Infantry Division, Commander Carusi's amphibious unit had the mission of providing battlefield medicine, establishing shore-to-ship communications, marking sea lanes, making emergency boat repairs, assisting in the removal of underwater obstructions, directing the landings and evacuating the casualties in the eastern Omaha Beach sectors code-named Easy Red, Fox Green and Fox Red. The 7th Naval Beach Battalion, attached to the 6th Engineer Special Brigade, would coordinate the landings on the western sectors of Omaha while the veteran 2nd Naval Beach Battalion, attached to the 1st Engineer Special Brigade, would be in charge of Utah Beach. The Royal Naval Commandos would handle troop landings and casualty evacuation on the British and Canadian beaches code-named Sword, Juno and Gold. Company "C" officers of the 6th Beach Battalion seated left to right: George "skipper" Clyburn and Don White. The 2nd row includes Beachmasters Joe Vaghi, Vince Perrin and Karl Hein. Medical officers standing are Russ Davey, John Kincaid and Mike Etzl. The young sailors are wearing their Army coveralls and Navy visor hats at the Amphibious Training Base, Fort Pierce, FL. 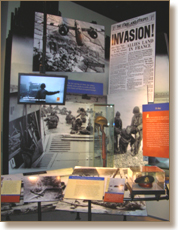 For 6 June 1944, steel helmets were worn as viewed in the photo of the Normandy invasion display at the Smithsonian Museum, Washington, D.C. In "Cross-Channel Trip," initially published in the 1, 8 and 15 July 1944 issues of The New Yorker magazine, war correspondent A.J. Liebling describes Commander Carusi and Beachmaster Joe Vaghi's C-8 platoon disembarking the USCG LCI(L) 88 port ramp and elements of the 37th Engineer Combat Battalion going down the starboard ramp at H+65 minutes [7:35 A.M.] on D-Day. Destined for "Easy Red" Omaha Beach, Liebling describes Beachmaster Vaghi first off the landing craft followed by Commander Eugene C. Carusi, Coxswain Ed Marriott, Louis "little boats" Strickland, John Hanley, Eddie Gorski, Frank Hurley, Bob Walley, Amin Isbir, Harold Roderick, Ray Castor, John Shrode, Corpsmen Andy Chmiel, George Abood, Bob Millican, Norman Paul, Al Silva, Howard Hampton, "little Dr. Davey"and the remainder of C-8 platoon of the 6th Naval Beach Battalion. "Cross-Channel Trip" can be read in Reporting World War II: American Journalism 1944-1946. By the time the 6th Beach Battalion was ashore providing casualty evacuation and Liebling was writing his war piece, the American public began receiving D-DAY INVASION NEWS!!! Navy censors removed from "Cross-Channel Trip," in Liebling's original 1944 manuscript, the actual number of the LCI(L) 88, descriptions of the casualties, Carusi's name and the disastrous fate of the USCG-manned LCI(L) 85. Platoon C-7 of Co. C, headed by Beachmaster Vince Perrin, disembarked from LCI(L) 89 while Beachmaster Karl Hein and surviving C-9 platoon members disembarked from LCI(L) 85 at 8:30 A.M. on D-Day. LCI(L) 85 took 25 direct hits and was later sunk. Among the numerous 6th Naval Beach Battalion casualties KIA aboard LCI(L) 85 were three of Carusi's junior officers - Jack Hagerty, G.E. Wade and Len Lewis. 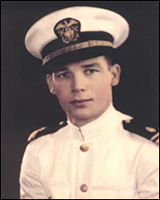 Later, USN Beachmaster James Allison was killed on the Fox Green sector of Omaha Beach. The 2nd, 6th and 7th Naval Beach Battalions, attached to the U.S. Army Engineer Special Brigades, had the shared mission of signaling landing craft ashore and getting casualties off the beach. By the end of June 1944, 452,460 troops, 70,910 vehicles and 289,827 tons of supplies were in northern France. As a result of expert Army and Navy aid on the beachhead and medical care during the Channel crossing, a majority of the 41,035 wounded Americans reaching England were in excellent condition. The mortality rate was 3/10 of 1%. 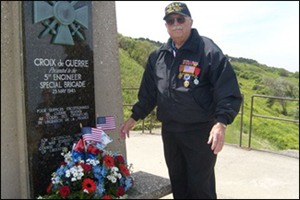 Col. William D. Bridges of the 5th Engineer Special Brigade reported, "The outstanding action of the 6th Naval Beach Battalion under heavy enemy fire contributed materially to the successful establishment of the Omaha beachhead. This battalion not only performed all of its own missions, but aided many other units in the accomplishment of theirs. But for this aid, the precarious situation of the units on the beach might have been turned into disaster." The SIXTH Naval Beach Battalion was awarded the Bronze Service Arrowhead, the Croix de Guerre with Palm by the Provisional Government of France and the Presidential Unit Citation 22 August 2000 by the U.S. Army. The 6th Naval Beach Battalion Presidential Unit Citation and a letter from President George W. Bush remain archived at The National D-Day Memorial Foundation in Bedford, VA.
With the OVERLORD Arch in the background, Don Burroughs remembers his shipmates at the 6 June 2001 dedication of The National D-Day Memorial. 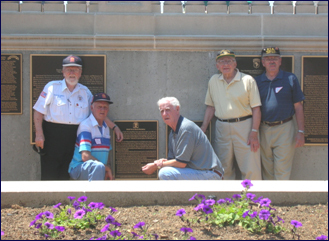 Five years later, left to right, Red Onines, Bob Giguere, Clyde Whirty, Vince Kordack and John Rogers participate in the dedication of the SIXTH Naval Beach Battalion plaque on Memorial Day 2006. In the 30 May 2000 letter President Bush wrote, "The generation of World War II defeated history's greatest tyranny, leaving graves and freedom from Europe to Asia. Perhaps nowhere was this heroism more vividly displayed than on the beaches of Normandy, and few units paid so heavy a price as the 6th Naval Beach Battalion at Omaha Beach. The unusual hazards they faced required exceptional daring and courage, yet the 6th Naval Beach Battalion stood tall in spite of tremendous odds. They risked their lives and often paid the ultimate price in defending the independence and freedoms we hold so dear." Surviving battalion officers include 92-year-old Dr. Lee Parker and 89-year-old Joe Vaghi. 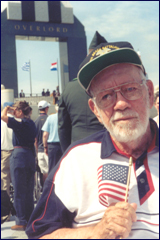 Lt. J. Lee Parker was featured in BuMed's Department of Defense documentary Navy Medicine at Normandy D-Day June 6, 1944. Lt. Commander Vaghi was interviewed for "Untold Stories of D-Day" in the June 2002 issue of National Geographic, served as a Voorsanger Architects, PC consultant regarding The National World War II Museum in New Orleans, delivered the keynote speech at the unveiling of the National WWII Memorial Stamp in Washington, D.C. and was interviewed for THE WAR, a 2007 PBS documentary produced by Ken Burns and Lynn Novick. The NYU School of Journalism includes war correspondent A.J. Liebling's "Cross-Channel Trip" - covering the Battalion on D-Day in the The New Yorker Book of War Pieces - among the top 100 journalistic pieces of the 20th Century. Barbara Walden and Frank Walden are our 6th Naval Beach Battalion senior advisors. Anne Hall Gould, daughter of Lt. Cmdr. E.V. Hall, is our reunion coordinator. For historical information, contact Ken Davey. 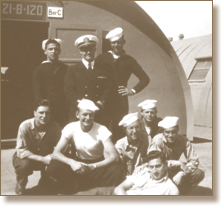 Beachmaster Vince Perrin and his men after the Normandy invasion at Oceanside, CA in 1944. 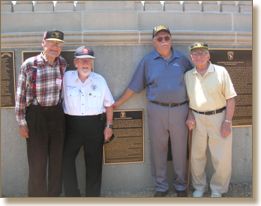 Nearly 62 years after D-Day, (left to right) Joe Vaghi, Red Onines, Bob Watson and Vince Kordack remember their fallen shipmates at The National D-Day Memorial in Bedford, VA.
Easy Red Easier This Time In! At St. Lazarre Station in Paris, a huge map of the assault area was on the apron of the station, and crowds gathered and studied it constantly, some staying but a moment, others studying intently, some with tears. Almost without a break, if a veteran was identified by his I.D. tag or special clothing, (and Americans do stand out!) the French, men and woman alike, all ages, would greet them warmly, some offering the double-cheek kiss, some an embrace, others a timid handshake. They wanted to know exactly where the particular veteran they were talking to had "gone in," and when Omaha was mentioned, there were extra "ahhs," and their knowledge of the battle was apparent. The St. Lazarre Station was the main link from Paris to the pretty little towns in Normandy, thus the large display. Buses took us to a staging point, where we boarded other busses all numbered. We were told we would return to those buses for the ride back into Bayeaux at the conclusion of the Ceremony. Our bus was number M-50. We could remember that, M was our initial and it was the 50th anniversary. The Ceremony was to take place at 5:30, about 25 miles from where we were. There was an army of busses, and they departed the staging area about 5-7 minutes apart, effectively allowing us to get off the bus, file through a tent housing hot coffee, cold Cokes, donuts, literature etc. We didn't even realize we were being "herded," it was so smoothly done. Outside the huge tent, we formed four lines, and went through security checks. Then we were free to find our seats. The I.D. tags were coded by the hour you were on the beach, so unbeknownst to us, we had priority seating and actually were on the fourth row, about three seats from Walter Cronkite and about 15 from the President. We went very early, thinking we would have to push and shove a little to get a sight of the stage, so it was with great pride we were escorted to the front. Ongoing concerts made the time fly. The music brought jubilation and tears. It was intensely emotional. Ed Marriott wandered through the aisles looking for buddies, when a voice asked if that was a Beach Battalion insignia on his jacket. It took but a moment for Joe Vaghi and Ed Marriott to recognize each other, and they embraced under the sky at the American Cemetery in Colleville. There had been telephone calls and a few exchanges over the years, but this was face-to-face. Touching. Powerful. The two walked quietly through the white crosses at Colleville, each with memories too locked in to discuss. It was healing. In tribute to Ed Marriott and his shipmates, President Bill Clinton wrote the following to the son of a deceased 6th Beach Battalion veteran. "The recent ceremonies commemorating the fiftieth anniversary of D-Day were extremely moving, and I was honored to participate in them. The brave soldiers like your father who stormed the beaches of Omaha, together with so many others who sacrificed during World War II for causes of liberty and justice, successfully turned the tide of the twentieth century and helped shape the world as we know it. America can be proud of their valiant efforts, which helped secure our freedoms for the last fifty years." Dr. Lee Parker before the Normandy invasion and Bob Watson on D-Day plus 65 years.